Web portals are Internet-based applications that provide a big amount of data. The data consumer who uses the data given by these applications needs to assess data quality. Due to the relevance of data quality on the Web together with the fact that DQ needs to be assessed within the context in which data are generated, data quality models specific to this context are necessary. 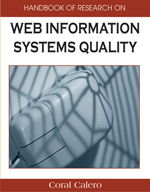 In this chapter, we will introduce a model for data quality in Web portals (PDQM). PDQM has been built upon the foundation of three key aspects: (1) a set of Web data quality attributes identified in the literature in this area, (2) data quality expectations of data consumers on the Internet, and (3) the functionalities that a Web portal may offer its users. Data Quality: Data has quality when it has “fitness for use,” that is, when it meets user requirements. Portal Functionalities: Basic software functions in Web portals that are used for users to interact with a Web portal. Data Quality Model: A defined set of relevant attributes and relationships between them, which provides a framework for specifying data quality requirements and evaluating data quality. Data Quality Attribute: Characteristics or properties of data that are relevant in a specific context. Data Consumer: Person who uses data for a specific purpose and can be affected by its quality. Evaluation: The activity of assessing the quality of a system or the data it contains. Web Portals: Internet-based applications that enable access to different sources (providers) through a single interface which provides personalization, single sign on, content aggregation from different sources and which hosts the presentation layer of Information Systems.